Read from May 27 to 30, 2015. This book has been on my to-read list since the beginning of my university days. I recall reading some of Plath’s poetry during this time but having known so little about her at the time and not having the maturity in regards to her situation, I never found the poems as potent as they were intended to be. Without getting into too much into literary theory, I will state that I do believe that with some pieces of literature it is important to know the history of the author and how their history can intentionally be placed into their work. I believe that Plath’s work fits for this circumstance. For those that don’t know, Sylvia Plath was an American writer who was born in 1932. Her father died when she was just a girl, an event that would change Plath and affect her writing substantially in the future. Plath attended college and was a promising student with top marks. She was offered a guest editing position at a top women’s magazine but it was not what Plath hoped it would be and this is when her mental health issues started to show. She survived her first suicide attempt after overdosing on her mother’s sleeping pills and crawling into a hole outside. She was hospitalized and given psychiatric treatment which, at the time, included insulin shots and electric shock treatment. Plath seemed to make a decent recovery after 6 months in treatment and returned to college. It was here where she meets her future husband, Ted Hughes, who ends up becoming a famous and notable English writer. During their marriage she gave birth to two children and had one miscarriage, an event that also presents itself in her writing. Plath was also in a car accident, which was likely another suicide attempt. Shortly after, Plath and Hughes separated after Plath discovered that Hughes was having an affair. After the separation is when Plath wrote some of her most important pieces, but sadly she committed her final act of suicide and died on February 11, 1963, just days after being prescribed anti-depressants. Plath died of carbon monoxide poisoning. She barricaded herself in the kitchen and placed her head inside the oven with the gas turned on. 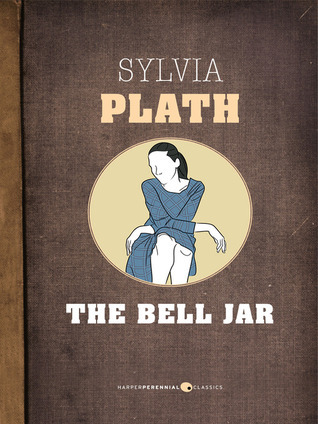 Plath’s life was tumultuous and tragic and The Bell Jar is a semi-biographical story that reflects the beginning of Plath’s life and illness before she meets Hughes. Esther Greenwood is a young, smart and ambitious woman who has just started the beginning, of what she is hoping to be a prominent and promising career in writing. She has been awarded the opportunity to intern at a popular women’s fashion magazine in New York, which is a dream come true for Esther. However, Esther slowly watches her ambitions drain away as an unstoppable depression begins to take over. As her ambition fades and the depression takes its toll, so does her once in a lifetime chance of making it in New York, in which, at this point Esther is so numb with depression she nearly doesn’t care. She almost marries, she is hospitalized and nearly dies. The ending does give some hope that perhaps there is still a chance for her. I wonder if these were Plath’s own views and what changed her mind later in life to marry Hughes? There are many aspects in the book where Esther, despite protesting that she will never marry, still indicates that she wants it all: love, a family, but also her freedom. However she knows that she cannot have it all. Perhaps these are the same thoughts that brought Plath to succumb to her own marriage? Plath’s short life feels like a story unfinished, which also contributes to her still present popularity. Feminists have taken her under their wing and are devoted to her prose and the continuation of her legacy. It makes me curious to what kind of woman Plath would be now and what she would have become. This book has made a lasting impression on me and is a hugely important book for the continuation and understanding of mental health issues.